Happy Monday, everyone! Welcome to the month of April, and the first day means we have a new Mama Elephant challenge for you!! The challenge this time around is this awesome sketch above!! I created this fabulous card featuring the new Maggie Holmes line from Crate Paper! I combined this fabulous collection with Mama Elephant's "Hello" stamp set...and LOVE how it turned out! It may just be the photographer in me....but I am in LOVE with the bokeh papers that manufacturers are coming out with these days!! There will be TWO winners who will receive TWO stamp sets from our upcoming April release. How awesome is that!! 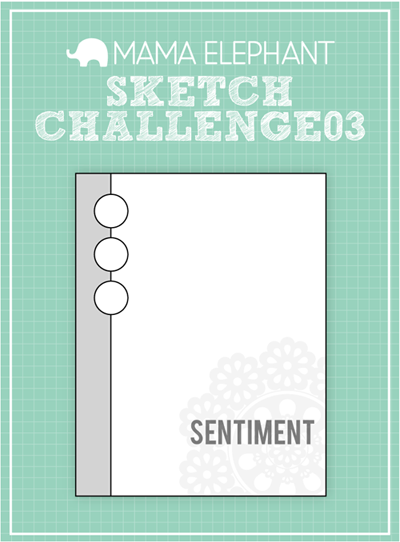 We can't wait to see what you create using the sketch and some Mama Elephant stamps or digital stamps!! I hope you enjoyed my card today!! Have a wonderful rest of your day! As always-- layered perfection! LOOOOOOOVE!!!! that is seriously the coolest, most beautiful card I have ever seen! Amazing card. Love the layers and colors. You rock. Your layering always amazes me! How do you do it? Gorgeous!